My family’s go to Staycation spot in Walt Disney World is the Cabins at Fort Wilderness Resort and Campground. Why you ask? Because when we step into Fort Wilderness we immediately relax and escape the hustle and bustle of life. Fort Wilderness Resort and Campground is quiet, filled with wildlife, and for our family filled with outdoor fun. I will preface this by saying, I am not a camper. This is the closest to camping I will probably ever come, but that’s ok. The cabins work for our family. We are a family of 5, we live in Orlando, and we go to Disney all the time. For us, we love Fort Wilderness because you don’t feel like you are at Disney. You are in the wilderness. There are trees everywhere, which is rare to see in most parts of Orlando. There is tons of wildlife all over the campgrounds. Almost everyday we have spotted families of dear, turkeys, a wide variety of birds, squirrels, and so much more. Now, most will look at the price tag of a cabin and say wow, that’s a little pricier than I want to pay, but if you plan it right, you can actually save money. The cabin has a full size refrigerator, a small stove top, a convection microwave oven, and a grill outside. We bring our own food and splurge on a meal out every now and again. So yes, the room rate may be higher than other rooms at Walt Disney World, but for a family of five, just eating breakfast and lunch in our rooms saves a ton of money. Oh and did I mention they also have a dishwasher in the room that housekeeping will run for you when they clean your room! The cabin comfortably sleeps 6 adults. For our family of 5, Mom and Dad sleep in the big bed, the 7 year old takes the top bunk, the 11 year old takes the bottom bunk, and the 17 year old sleeps on the pull out couch. This past summer we had grandma join us, and we all still fit comfortably in the cabin. The bathroom is pretty spacious and of course comes with your favorite Disney line of showering products. Outside is a very large porch with a picnic table overlooking beautiful views of the woods where you never know what animal might wander into your yard. Fort Wilderness rents golf carts, and I highly recommend you splurge and get one for the length of your trip. This is not only convenient to get from point A to point B, but it also is tons of fun. The kids love driving around and checking out all the different areas as well as decorating it which is something lots of guests enjoy doing. Disney does have numerous bus stops throughout the resort to get you wherever you need to go, so don’t fret if the golf cart is not in your budget. There are so many activities available at Fort Wilderness, from horseback riding, to swimming, canoeing, fishing, movies under the stars, campfire sing along, making smores, and so much more. Most times, we spend more time at the campground then at the parks. 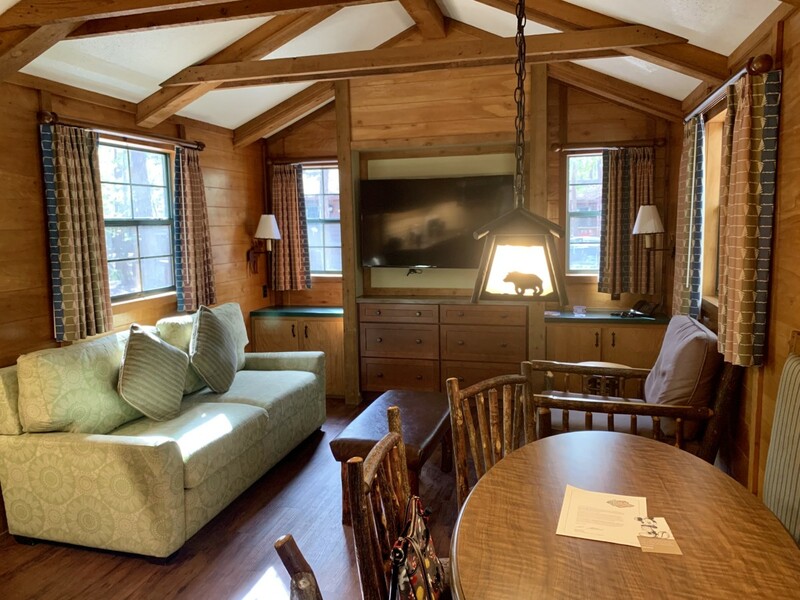 So next time you are booking a trip to Walt Disney World, consider checking out the Cabins at Fort Wilderness.